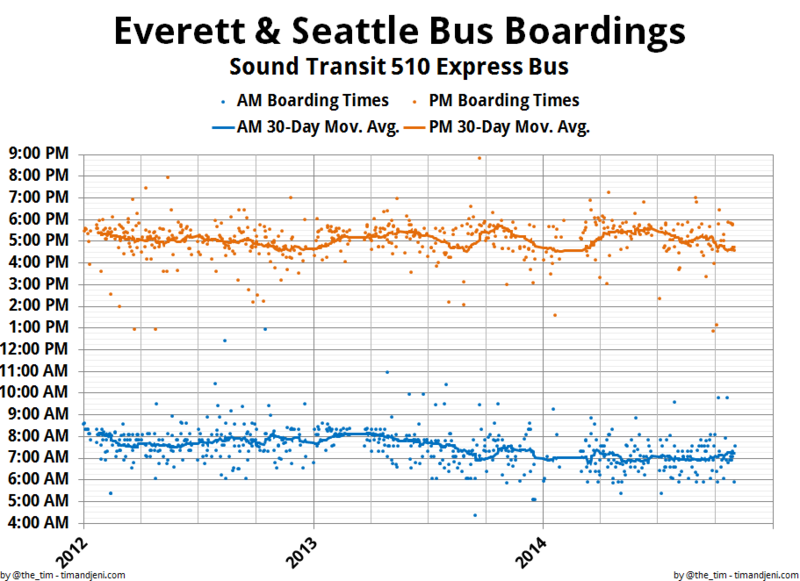 I get on the same bus at the South Everett Park and Ride and, not only have I not been able to sit down once in the past 3 – 4 weeks, I haven’t even been able to catch the first bus that rolls through when I’m in line. Every day since this weird traffic spike, I’ve had to wait for one bus to come and go before getting on the next one, which means if I need to be to work at 7am, I have to get to the park and ride at about 5:40 am to guarantee that I’m able to get a spot on the 6am bus. 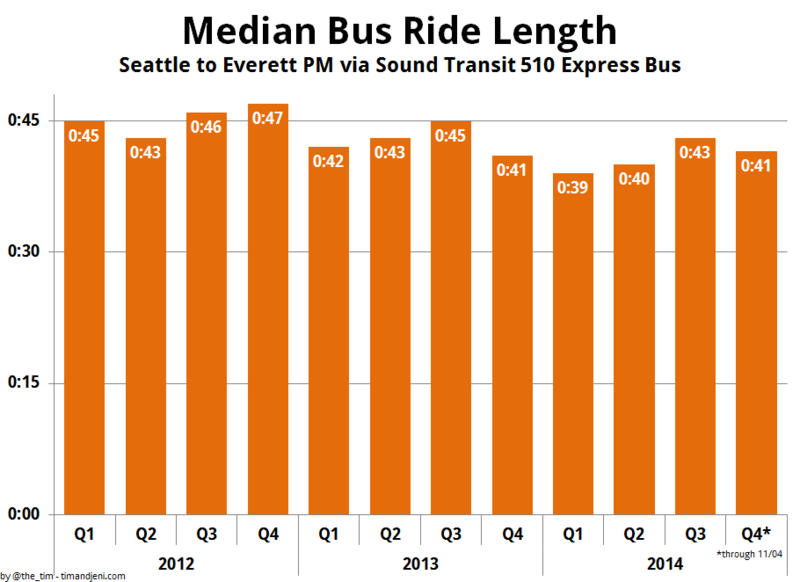 I take the 413 from Ash Way… So nice to see I’m not alone in noticing the Everett-Seattle commute has been absolutely dreadful lately. Hopefully the universe rights itself soon and we can go back to having our regular, not-great-but-not-incredibly-awful commute times. Thanks for putting this data out there! Very cool! I ride the 510 that leaves Everett at 5:35. It seems like with traffic getting worse, more and more people are riding the bus, because there aren’t any seats left by the time we leave the station. Traffic is still just as bad though. I ride the 41 from Convention Place Station 7.2 miles to Northgate Transit Center to and from work everyday. It is only one stop. In the morning it takes about 15 minutes to get to work. On the way home it fluctuates from 40 minutes to an hour and the bus is often filled with standing room only. I feel for you folks on the 510 and all the other bus lines. We definitely need some leadership on the City Council to provide a solution. HOV (High Occupancy Vehicle) Lanes and quicker response times to changes in ridership would be a good start. 2) What time does your commute start? I’m presuming that it has been relatively consistent. However, are you by any chance experiencing a different part of the commute congestion because it’s darker later in the morning during q4 and you’re sleeping later? Perhaps your trip home is more consistent because you’re able to avoid the evening congestion? 3) What tools are you using to record your intervals? 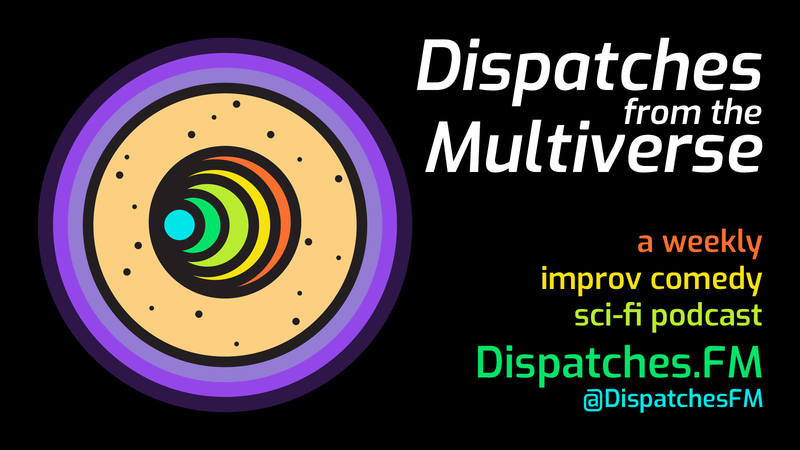 It might be interesting to hear about how you’ve constructed your data collection tools. I’ve been riding a motorcycle for part of that same path (from Mill Creek to a tech company just off of Stewart), and I am seeing more non-HOV drivers getting into the HOV lane than before, however I suspect that’s an effect of more cars on the road and drivers just getting frustrated with traffic. However, if they were not in the HOV lane, then I suspect your commute time would be reduced. 1) The 14 points aren’t different points along the bus route itself, but rather different points on either side of the bus ride. For example, what time I leave the house, what time I get to the bus stop, what time the bus was scheduled to come, etc. The charts above only count from when I actually got on the bus to when I got off the bus. Then I occasionally open the note on my PC via Evernote Web and do a copy-paste of this data into Excel, where I work the chart magic. Yes!! I take the 5:35am bus from Everett Station every weekday morning and for the last few months (and even more so the last few weeks), the bus has been SO packed. I have been attributing it to an increase in construction work downtown since I noticed a particular increase in construction worker ridership. But could it be anything else? More importantly, why isn’t Sound Transit sending more buses for this incredibly busy 5-6am rush hour??? This bus wasn’t this crazy busy a few years ago, but it has gotten ridiculous. Seriously. If you have to leave paying customers on the curb because you’re too full by the time you get to South Everett Freeway Station, then YOU NEED MORE BUSES. Thank you for this article! I have been totally wondering WHAT THE HECK HAPPENED the last few weeks. Traffic has totally gone off the cliff for no obvious reason, it’s just become a cluster. Great data, Tim. 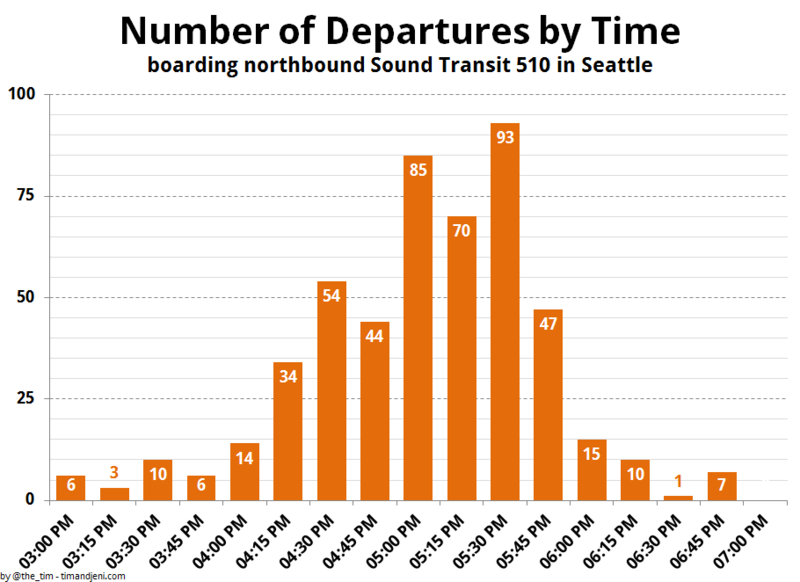 I’ve noticed that the southbound commute in the late afternoon/early evening has changed dramatically in the past few years. I used to be able to leave Lynnwood well after 5 pm and zip down to UW to teach a 6 pm class, with time to spare. Now if you leave at 5 pm it can take the entire hour to get to campus and get parked. 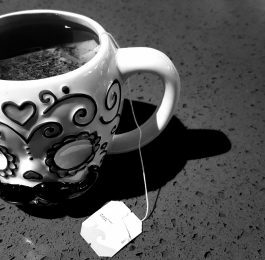 Anecdotal, though – no great data like you have here! I keep seeing all these complaints about Everett to Seattle traffic, but please note that Everett to Bellevue traffic is also just as bad. I finally left my Bellevue job after getting sick of the commute and plan on limiting my work options to Snohomish County only. When commuting to Bellevue, I found it was easier and faster to take slow neighborhood streets all the way to 522 in Bothell before getting on 405, and frequently took side streets all the way from Everett to Bellevue. 405 traffic was too unpredictable. Sometimes it would be 60 minutes one way, sometimes 120 minutes. Busing took even longer since I had to transfer. I take the 532 from Everett Station to Bellevue every morning. While we don’t have the issues with seating until we get to Totem Lake (usually), the time thing is a problem for many of the riders. I don’t usually have that problem because I have to get to the park and ride 2 1/2 hours before I have to be at work, because of the parking issues at that staton. I have sent several emails to sound transit complaining about the amout of people that park there, that don’t ride the bus or vanpools. 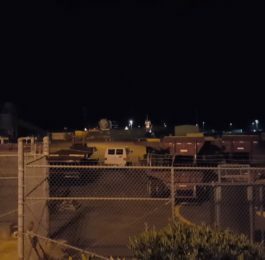 We have been so inundated with construction workers and others that you have to get there by 6am or forget getting a space. Many people are parking over at Silver Lake or on a street a couple of blocks down the road. Instead of doing something about it for their customers, they have put up signs telling us we can’t park at those places, and that we should drive to Ash way to park. Not a solution, Ash way is just as full as we are, and it’s 10 times the size! We are the ones paying for the maintenance of these park and rides, we should have priority. The need to find a way to restrict the parking to those that pay for it. 1. Really interesting that the traffic is as seasonal as it is. 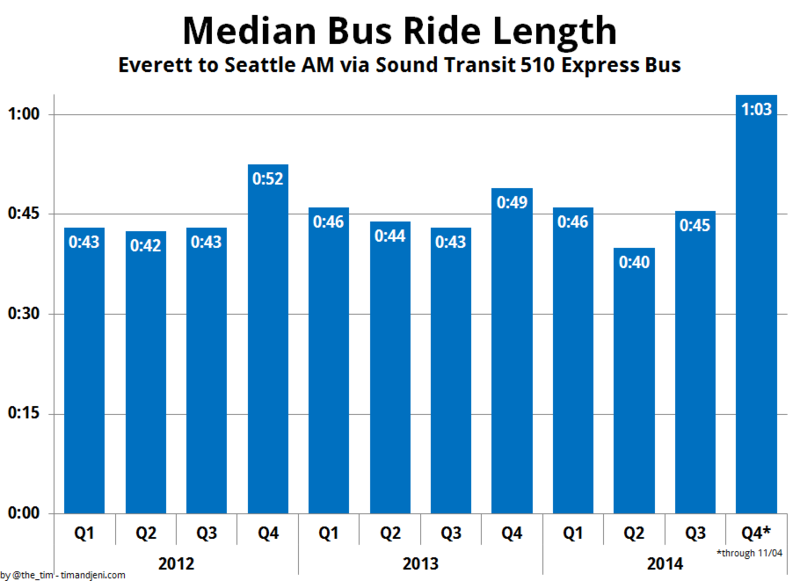 There’s a noticeable travel time uptick in Q4. 2. Interesting that the recent pain really seemed to start at the end of Sept-2014….precisely when the first round of Metro service cuts went into effect on Sept. 27th. Perhaps you’re seeing the impact of former Metro customers getting back in their cars and causing traffic headaches for everyone else….drivers and remaining transit customers alike. If that’s the case, it seems like a there should be some regional interest/benefit in ensuring transit continues to receive the funding it needs. Keep collecting that data, the second round of Metro cuts look like they’re slated for Feb-2015. I think tonight’s delay on Howell was due to having 1 lane fewer than normal. When I left at 4pm, the left lane was blocked by parked vehicles (today is a holiday, so they could park there). Although I would have thought that the number of companies that actually get today as a holiday might have balanced out the lane situation. You have missed data on the cross commute. 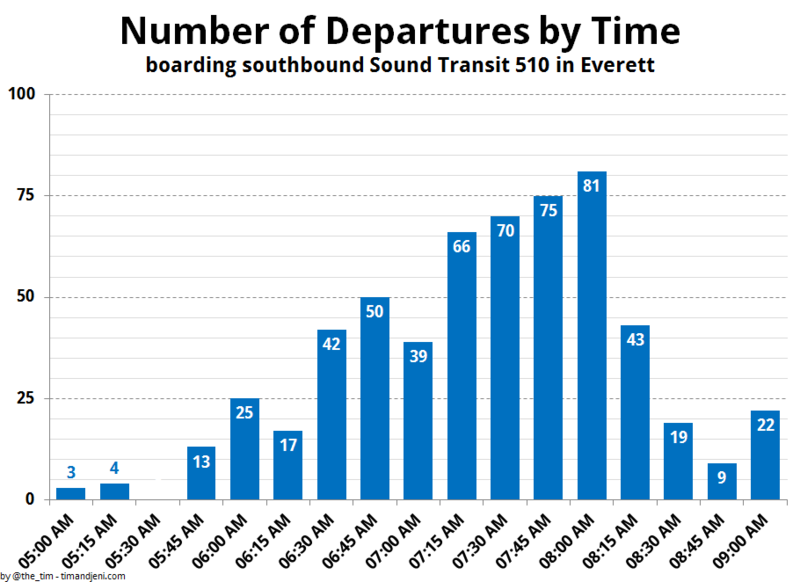 I commute from Seattle to Everett on the bus and with the horrible 512 service now, stopping at every stop commute in the morning and evening is over an hour and the return trip to Seattle in the afternoon can be an hour and a half to two hours from Everett Station to the ID. The train would be great to use but Sound Transit did not negotiate with BN for a reverse commute like they did with Tacoma. 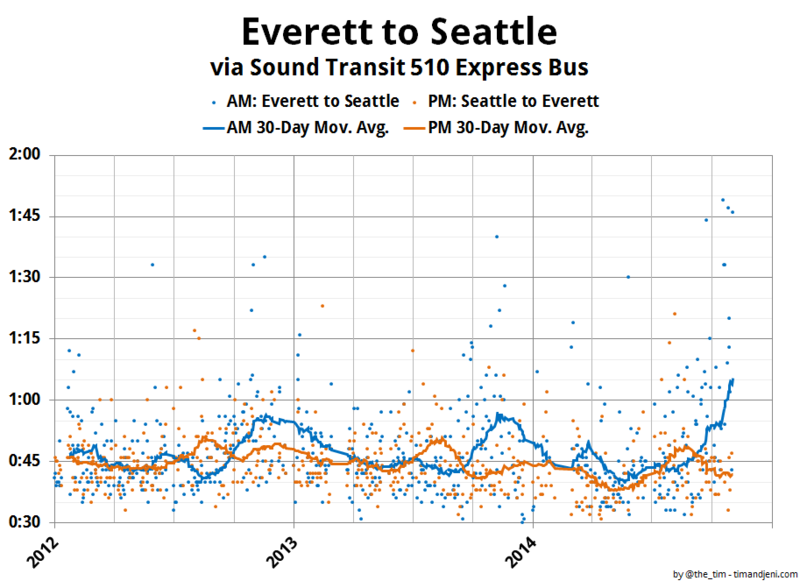 Yes both Everett and Seattle are destination spots for employment, time to get out the 1950’s mentality and provide quick commute service to both cities via bus and rail. A dedicated bus lane both ways on I-5 and Stewart St. is a must. Have others noticed ct’s (st’s sno co operator) inability to keep buses running 10 minutes apart, especially northbound in afternoon? Its not that they all run late, but one will, then will pick up almost two buses worth). The next one ends up almost right behind it. Can’t be traffic or they’d all be late. But ct refuses to pay attention and do anything about it.